The CI Cable Identifier will safely identify a dead (or de-energized) primary cable within a group of energized or de-energized cables as well as live secondary cables (including neutrals) up to 240 VAC (440 optional). The absolute safe identification is based on polarity and signal magnitude of the DC pulse (up to 100 A) coming from the transmitter, which is picked up by the receiver and a clip-on probe. The transmitter can operate on 120 VAC or internal battery (up to 50 hrs run time). The entire system functions without user adjustments and will, under no circumstances, provide a false positive identification. 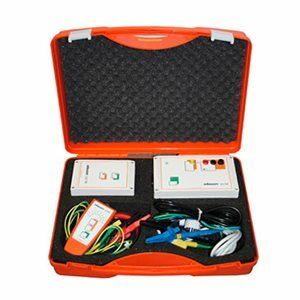 The standard combination kit (for HV & LV cables) includes a 6” flexible clip-on probe, and two touch sensors for all your applications where a clip on cannot be used.